For the longest time I able to avoid Pinterest. Partially because I didn't totally understand it right away and partially because I wasn't sure that I wanted to have access to one more thing that would consume some more of my time. Well, about eight months ago I gave in, and I have to say, I've had some fun. I have a bucket full of craft ideas that sound fun, an even larger bucket of recipes I want to try, and was able to put some of my creations out there. All in all, a fun time, but I have experienced those days where I find more than I could possibly do and spent the time looking at new stuff and not actually accomplishing all the pins I have. I'm going to guess, I'm not the only one there that sees an hour go by, has a ton of ideas gathered and by then it's time to make dinner or do the laundry and the Pins are saved for another day. On that note, here is a Pin that I actually got to. This is a great new addition to the Christmas Cookie repertoire especially since it can resemble a little present. They are super easy to make and even better to eat. The most difficult part of this little treat is unwrapping the Hershey Kisses, so, an extra set of little hands can be wonderful in the kitchen on this (just make sure to watch the number of kisses that can disappear into the little ones mouth). 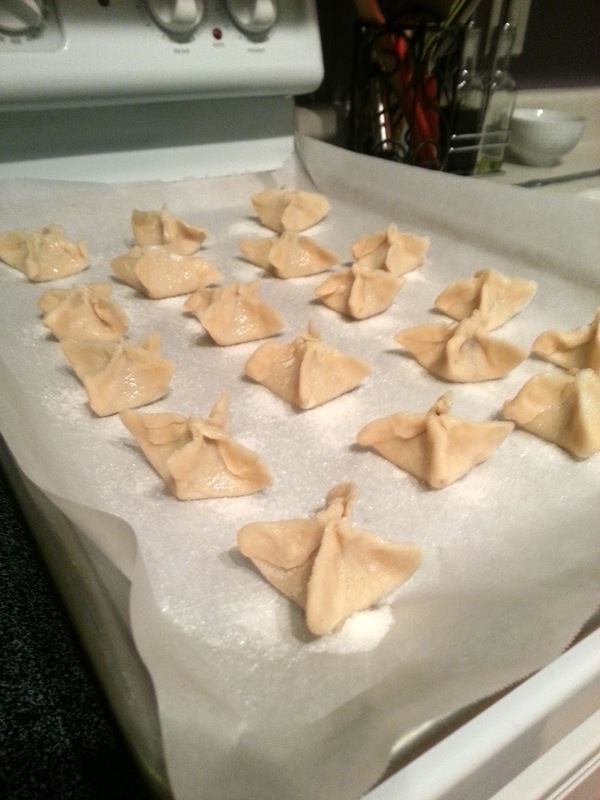 Preheat oven to 350 degrees and line your baking sheet with parchment paper or a Silpat mat. Roll out your pie crust on a floured surface. 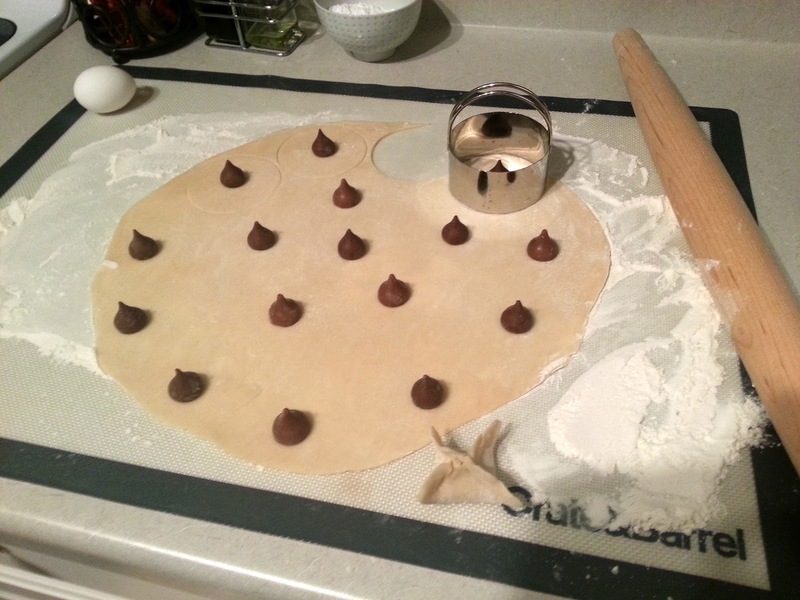 Place unwrapped Hershey Kisses in around the edge of the pie crust. Using a biscuit cutter, cut the dough around each kiss. Outline more circles in the dough until there are no open spaces left. Pull up dough on opposite ends and pinch together. Rotate and pinch the other two sides together until the kiss is no longer showing. Finish all of the mini pies and arrange on lined baking sheet. You can roll out the left over dough to make fit more circles, but only roll out one time. After that, it can get tough. Whisk egg white and brush the tops of the treats. Sprinkle with granulated sugar...as much as you would like. Place in the oven and bake for 22-26 minutes. 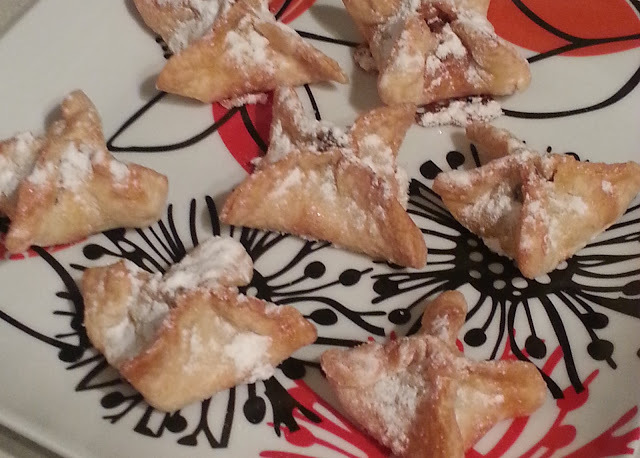 Let cool for about 5 minutes and sprinkle with powdered sugar. These treats are best eaten fresh and wonderful when they are still a little warm. I experimented with Caramel Kisses and would steer clear of that in the future. The caramel will break out of the cookie while baking and can become more of a harder, chewy caramel instead of the creamy caramel when you eat them normally. *Recipe from Picky Palate - Kiss Pies.